The Little Tulips baby quilt pattern is made with a scrappy assortment of blocks sewn with my Lovely Little Tulips quilt blocks. The tulips quilt blocks finish at 8" x 8" and are placed on point in the baby quilt. The block backgrounds are white and a white inner border extends the background, making the tulips appear to float. Setting and corner triangles are white, too, and a multicolored border stretches around the outer edges of the quilt. Oversized setting and corner triangles can substitute for the inner border if you prefer. Cut the parent blocks (see instructions on Page 2) a 2-3 inches larger than necessary to create the floating look. I think this baby quilt looks best when all backgrounds are alike. If you use scraps for backgrounds (in blocks and other areas) I recommend that you try to keep their color value (contrast) very similar. The tulip blocks are perfect if you want to make a scrap quilt but alter the appearance in any way you like. I've included yardage totals for anyone who would like to make each of the 18 quilt blocks from the same four fabrics. Omit some of the tulip blocks and replace them with 8-1/2" x 8-1/2" white squares if you don't have lots of scraps. One option is to make a total of 12 tulip blocks and use the plain squares to replace the blocks that end up arranged side by side in groups of two. Increase background yardage if you replace blocks with plain squares. Finished Size with Two Borders: about 47" x 60"
Refer to the pattern linked in the first paragraph above for block assembly instructions. Yardage depends on the width of strips. I would probably use a bit less than 1/2 yard. 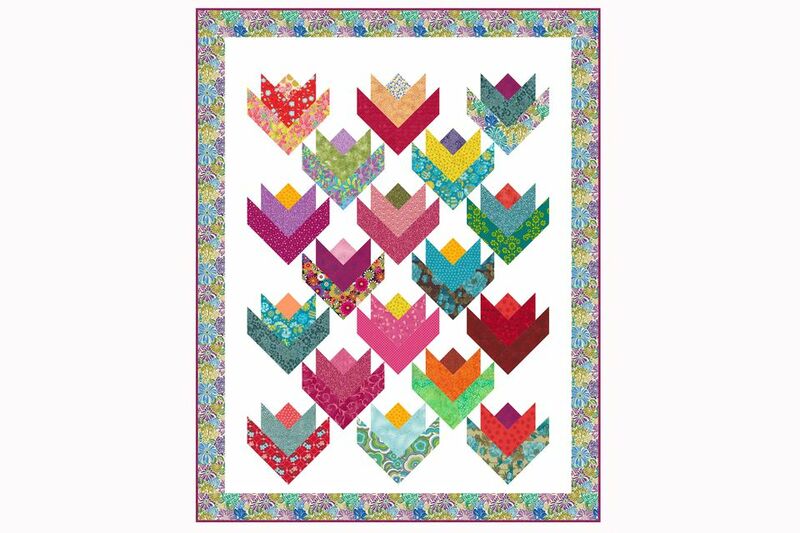 Use the link on page 1 to make 18 tulip quilt blocks. Each completed block should measure 8-1/2" x 8-1/2". Corner and setting triangles are both cut from large 'parent' squares of fabric, but they are cut in different ways. Corner triangles are cut so that the fabric's straight grain runs parallel to the short edges. Setting triangles, used in the remaining openings at the end of diagonal rows, are cut so that the straight grain runs parallel to the longest edge. It's always best to have straight grain edges on the outside of quilting components and the quilt top itself. Learn more about setting and corner triangles and find instructions for cutting the triangles to fit against more quilt block sizes. Cut (2) 6-5/8" x 6-5/8" squares and then cut each in half once diagonally. Cut (3) 12-5/8" x 12-5/8" squares and then cut each in half twice diagonally. Two of the triangles won't be used unless you are making a larger quilt. Mark the longest edge of each to identify the straight grain, and use the triangles later to cut other patches you might need. Arrange the 18 quilt blocks, the corner triangles, and the setting triangles as illustrated above. A quilt design wall or other flat surface makes layout an easy task. See Page 3 for four different layout options. Check the alignment of your blocks and triangles. If you're making a scrap quilt, leave the room for awhile. Take a look at block arrangement when you return. Should the tulips blocks be shifted around for better color balance? Rearrange blocks until you are happy with the layout. Sew the blocks and setting triangles in each diagonal row together. The pointed ends of triangles will extend beyond block edges, creating little 'dog ear' triangles that can be clipped. Use straight pins to keep the aligned blocks from shifting. Don't sew the corner triangles yet. Press to set the seams as you work on each row. Press seam allowances that attach triangles towards the triangles. Press seam allowances between blocks in adjoining rows in opposite directions. Join the rows, butting seams carefully for a perfect match. Center the long edge of a corner triangle with a corner of the quilt and sew. Repeat to sew all corners. Press seams towards the triangles. Setting and corner triangles are always cut just a bit larger than necessary, but the triangles used in this quilt are very close to their true size. Remove the tiny excess if necessary but take care not to trim into the quarter inch seam allowance that surrounds the quilt. Measure for borders as described in my straight border instructions. Use 1-1/2" wide strips for the inner border. Add the top and bottom borders first. The side borders must be pieced if you are using crosswise grain strips. Measure again before sewing the outer border with 3-1/2" wide strips. Sew the top and bottom borders first and then piece the side borders to achieve the length required. Mark the quilt top for quilting if necessary. Sandwich the quilt top with batting and backing. Baste to secure the layers. Use a technique appropriate for the type of quilting planned. Basting options include adhesive basting products, thread, and basting with safety pins for machine quilting. Quilt the quilt. Remove excess batting and backing and bind the edges with easy mitered doublefold binding. Baby quilts are usually washed often -- singlefold binding is not usually durable enough for the quilts. Each of the layout options illustrated on this page is made up of four tulips quilt blocks. The layouts probably won't work for the baby quilt but could be used for a slightly larger project. Treat each group of four as a single quilt block that measures 16-1/2" x 16-1/2" (unfinished). Experiment with layout variations of your own to create a unique quilt.